ANYWAY, where were we? Oh yes, salad. I’m a fool for the stuff lately. And this variation — a panzanella salad with tomatoes, olives, fresh zucchini, feta cheese and baby greens — is my current jam. 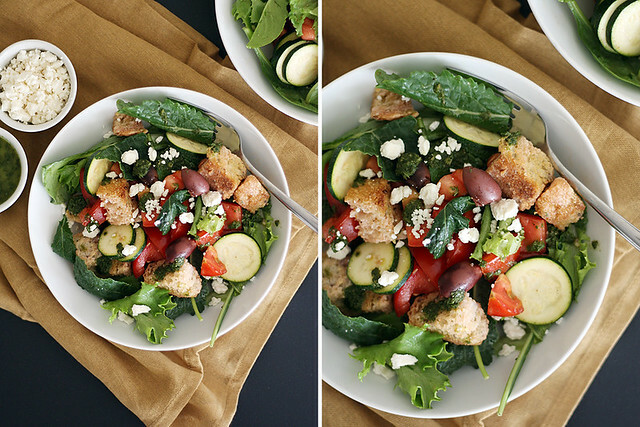 It’s a hybrid between a Greek salad and a classic panzanella, and it is delightful. Between that and grilled pizza, I am set for summer sustenance. Of course, one cannot have a good salad with a base of good greens, so when organicgirl contacted me about trying their greens (and giving away some of them to one of you lovely readers! But I’ll get to that in a sec), I was all over it. Now I know what you’re thinking — “Aren’t greens just greens? Don’t they all taste the same?” And maybe a few weeks ago I would have agreed with you, but you guys, it’s simply not true. organicgirl not only uses the freshest ingredients for their products, but they make some pretty delicious mixes of greens, from Supergreens, a mix of baby greens like arugula, spinach, tat soi and chard; to Five Happiness, a mix of bok choy, tango, arugula, spinach, chard, romaine and other greens; to I Heart Baby Kale, a mix of baby kale, spinach, green chard, oakleaf lettuce and other greens. They also strive to support sustainable farming and recycling practices with their products, which is something Elliott and I love to support whenever we can. 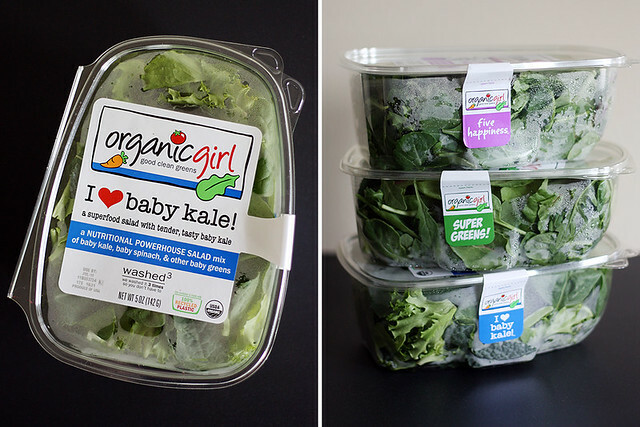 I chose to use organicgirl’s I Heart Baby Kale mix when making my new go-to salad, and I was blown away by how a simple mix of greens can make a salad so much tastier. I loved the crunch of the fresh lettuces as well as the combination of flavors rendered by the kale, spinach and chard — a mix of sweet, savory and a little peppery. It was a fantastic base to this salad, but I’m sure it would also make a great addition to sandwiches, sautes and bakes (like a casserole or frittata). Basically, I’m hooked. 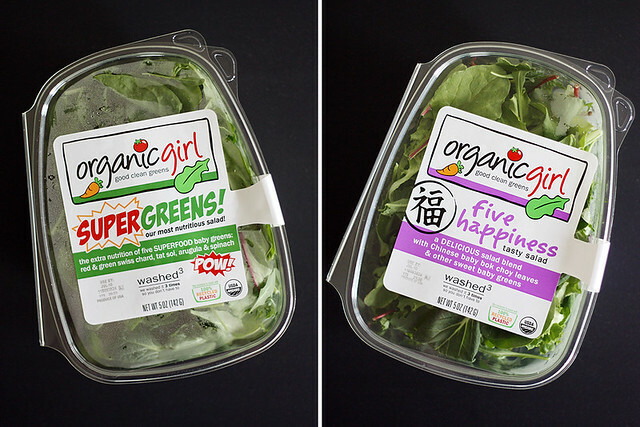 Of course, I can’t wax poetic about these greens without letting you try them out for yourself, so I’m giving away three clamshells of organicgirl products — Supergreens, I Heart Baby Kale and Five Happiness — to one lucky reader! To enter, please visit organicgirl’s website, Facebook page and Twitter page and leave a comment below sharing one way you love incorporating more greens into your diet. And that’s it! Contest ends on Friday, July 12 at 11:59 p.m. CST. 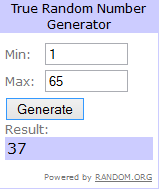 Winner will be announced Saturday, July 13 (giveaway is open to U.S. residents only). Update: Heather is our winner. Thanks for playing, everyone! Toss bread cubes in a large bowl with 2 tablespoons olive oil and salt and pepper to taste. Add tomatoes, zucchini, greens, olives and salt and pepper to taste; toss lightly to combine. 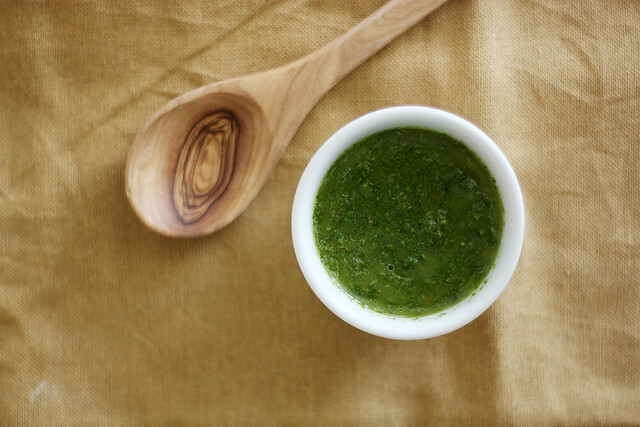 Combine basil, mint, garlic, vinegar, water and remaining 4 tablespoons olive oil in the bowl of a food processor; pulse until pureed to the consistency of dressing or pesto. Add as much dressing as desired to the salad and toss to combine. Serve salad immediately with crumbled feta cheese sprinkled on top. Disclosure: I received samples of organicgirl products for review purposes only. All opinions are my own. I always add mint to my salads, one of my little secrets 🙂 🙂 🙂 Also, I LOVED Alex Mack, too. We are twins. I am still waiting for kale to go commercial in Australia… Poo. This is lovely salad mix, I have to try this myself sometime this week. Oh man, I ALWAYS have OrganicGirl products in my fridge. We use the different mixes and spinach in salads and the baby kale packages for our green smoothies. So youm!!! This salad is gorgeous. What a great way to showcase summer flavors! We have been inundated with greens from our CSA and it’s making me INSANELY happy. I’m a greens-aholic; I could put them in anything. Well. Maybe not oatmeal. Salads are my go-to option for more greens, but I love them with eggs, too; a good pizza is always made better by a spattering of greens and of course, stuffing them in a sandwich works too. I’m loving the heat we have had and devour salads in the summer just like you. So delicious! I am with you. Even though is is not hot like at all here (think 40 in the morning, high of 60 during the day) I am still all over the grill and salads. I actually just made a panzanella salad the other day. I am loving you tomato-olive version! Sounds and looks perfect! We probably buy the I Heart Baby Kale mix 2 times a week – it’s a staple around our house! My husband loves adding it to his smoothies, and I love tossing it with some Caesar dressing and shaved parm for a delicious lunch! Oh — and amazing Alex Mack reference. LOVED her. LOVED Alex Mack! And remember she could levitate things too…awesome. Awesome salad. I did all three and I have been eating Kale chips and lots of spinach salad lately! I would love to try these greens though! I LOVE Organic girl! Their stuff is all I use for salads! I feel so naiive, I thought they were only on the west coast and am happy to see they have a much larger reach than I had thought!! Very cool! Hope you had a happy 4th and your salad looks amazing! Oh. Yum. I know what’s for dinner! I love getting more greens in my diet by wilting them in a pan with a smidge of butter, and then making little holes so I can slowly cook eggs in little pockets of greens. Yup – great minds think alike! And the olives and tomatoes, hello!! 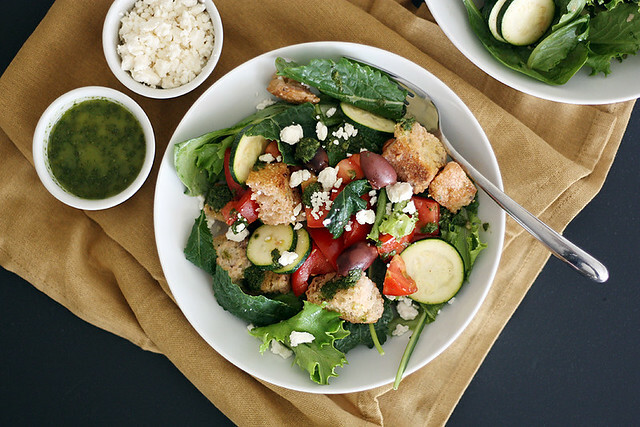 Love a pretty panzanella- AND all things Greek! Looks delicious! I adore their lettuce! And this salad, forget.about.it! I’ll take two bowls, PA-LEASE?! I’ve tried Organic Girl greens before as well and I couldn’t be more impressed. I love the baby kale mix. And nothing like a good salad keeps me cool in the summer! Would love to win! I would like to start making breakfast sandwiches in the morning with either greens piled high on the salad OR a salad on the side. If I start out with greens in the morning, I’m more likely to eat them throughout the day! 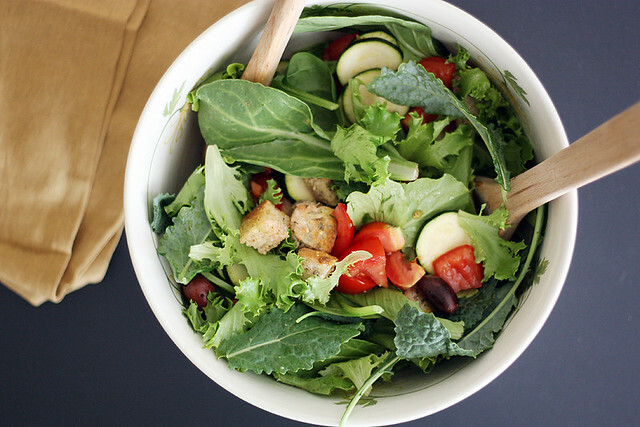 I love the idea of using supergreens like Kale as the base of a traditional salad. I add these greens to everything: soups, smoothies, salads and anywhere else I can sneak them in. I even made green pancakes for dinner the other night, using kale and swiss chard! It’s an obsession! Can’t wait to try your panzanella. I loove greens! I’ll take ’em any way I can get ’em. But I’ve had to resort to some sneaky tricks to get my boyfriend to eat them, like baking them into muffins or wilting into a cheesy soup. What a big bowl of healthy gorgeousness! Lately, I”m all about kale pineapple smoothies. Sounds weird, but tastes amazing! 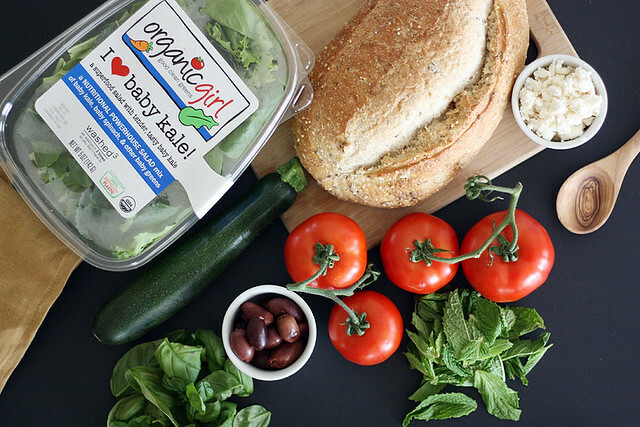 A “green monster” smoothie just wouldn’t be the same without organicgirl baby kale! It totally rocks! Such an easy beautiful salad. I pretty much eat Organic Girl daily…three clamshells a week!! I have a salad for at least one meal a day, and try to pair some veggies, especially spinach, with my eggs for breakfast! LOVE the look of this salad!! Yum! Ways I incorporate greens into my diet: smoothies, salads and when I can, into meals, like mixed in with my pasta or in lasagna etc. Love this!! Absolutely gorgeous salad, Steph! This is so perfect for summer lunches or light dinners. My favorite way to incorporate greens is to sneak them into baked dishes like casseroles and frittatas! I do love a good hearty salad especially during the warm summer months!! It’s not complicated, we just now eat massive salads every single day, twice (sometimes more) a day! I like to get more greens in my diet by eating more salads, and wonderful fresh Summer garden vegis on the grill. I’m cracking up – you are SO right – I’ve been melting and refusing to complain!! Minnesotans know how to appreciate the few good weather months we have!! I love panzanella and anything Greek. And I have tried their greens before! All’s good! I like adding greens to my smoothies in the mornings. Such a great way to get in a great vitamin boost! My son calls it “Hulk juice”! It’s been pretty toasty around here too. This salad sounds delicious and refreshing! I love to make savory oatmeal for breakfast, topped with a handful of arugula and I feel great! I love that extra boost of greens in the morning. I love using different greens in pesto, such a delicious way to make pasta more healthy for you. I’ve been eating a lot of salads lately, too! However, instead of looking all pretty and sophisticated, it’s just a bunch of heaps of frozen peas and gobs of ranch dressing. *sniffs* my salads are ugly. I want one like this! Bread in a salad? I meaaaaan… hello! I’m a total green pizza lover-braised greens always end up on my plate. I’ll grab some fresh basil from my garden and wrap the basil and a cherry tomato with palm full of greens and pop it in my mouth for a tasty snack. I can honestly say I’ve never heard of Organic Girl before this post. Thanks for introducing me! I get tired of salads pretty quickly, but I incorporate my greens into wraps. Works like a charm! I love to add greens to my eggs! I throw spinach into my smoothies in the morning. It’s my favorite summer breakfast! i eat salad for lunch nearly on the daily in the summer. just ate one w/ mint & shrimp & peas! and i have to say, that baby kale sounds great– much better than dinosaur kale. have you ever had that? super bizarre name. I get my greens by blending up a kale & spinach superfood smoothie! Also love eating baby mixed green salads too! Yum! Okay, panzanella is basically the only salad I look forward to eating! THose toasty bread cubes = the.best. And fun mix-ins like olives and feta and zucchini help too. 🙂 I am SUPER picky about the greens that I eat…it’s all organic all the way! I love throwing them into pasta in the last minute of cooking! I always have a big heaping plate of salad for lunch loaded with a variety of spring mix greens and spinach with chopped chicken or tuna, walnuts, chopped apples, tomatoes, avocadoes and shredded cheese too! 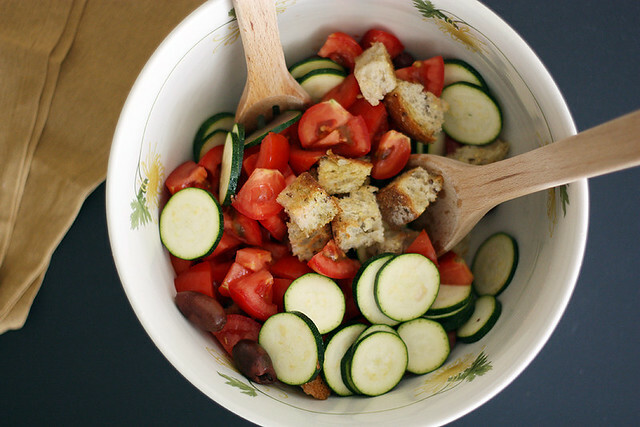 Love this fun take on panzanella! Organic Girl greens are awesome!! I love stuffing leafy greens in my morning smoothies. I love panzanella!!! These greens look amazing. I wish our local stores carried these mixes. Lately I have been a huge fan of working greens like kale and arugula into pasta dishes. Either letting them wilt down and eating the pasta hot or working them into a cold pasta salad. Oh my, I love how pretty this salad looks! I live off greens and salads during the hot summer months too and yours sounds amazing with the mint and basil. Sounds delicious! I get my greens in for breakfast by blending up a thick spinach fruit smoothie to start the day! I like keeping my greens fresh and natural to get the best benefits out of them. So salads and fresh chutneys with them are great ways to get my family and friends dipping in for more! Smoothies are a super easy to sneak in some greens! Lately I’ve been adding baby kale to my stir-fry lunches. I also like wilted greens on pizza.